There's one final calendar recipe for 2013 that I didn't get to on time. It wasn't for lack of interest - October's recipe looked like a great sweet breakfast, but I couldn't reliably access the required nectarines until December. So here it is at last - fruit toast, vanilla yoghurt, and some lovely caramel-coated, cinnamon-spiked nectarines. I'll be using any excuse I can to pull this trick on stone fruit for as long as they're available. Cut a small, shallow cross in the bottom of each nectarine, place them in a bowl and pour boiling water over them. Allow the nectarines to sit for one minute before draining off the water. Let the nectarines cool. Stir together the yoghurt and vanilla and set them aside. When the nectarines are cool enough to handle peel off their skins, starting where it's pulled away at the cross. Slice the nectarines into eight wedges, discarding the stone. Set a saucepan over medium heat and pour in the sugar, it will melt and turn golden. Add the butter and cinnamon, swirling the saucepan to combine the ingredients. Add the nectarine wedges, turning them to coat them in the caramel and allowing them to cook and soften for a couple of minutes. Toast the bread and slice the pieces diagonally, dividing them between two plates. Pour over the nectarines and caramel, and dollop on the vanilla yoghurt. This year we hit the one of the more traditional points in our Christmas cycle, sharing lunch with Michael's extended family on the Sunshine Coast. Everyone else tends to focus on chicken, ham and prawns so we always make sure to bring a vego dish or two. This time around we streamlined a couple of recipes from the archives, so as not to take too much time or create excessive mess in someone else's kitchen. Zucchini ribbons in pesto are even quicker when you buy a tub of ready-made pesto - just shred up the greens, pour over the pesto, add a squeeze of lemon and toss it all together. It's light and refeshing, and lasts well into the next day without getting wilted or slimey. For something more substantial, we revisited the Moroccan Soup Bar-inspired chickpea thing. Since we were serving it at room temperature, we only needed heat to toast the almonds and fry some garlic, whisking together the yoghurt dressing and folding in canned chickpeas in a bowl. Rather than frying pita bread, I hatched the idea of substituting plain corn chips. They had the right crunchy, slightly grainy texture and were gluten-free as a bonus. The salad gave our lunch a little heft, though the leftovers were notably soggier come dinner time. Catering for twenty-five, the table also boasted mini pumpkin quiches, potatoes and a couple more fresh green salads so we weren't left wanting for food or company. Cindy and I headed to St Kilda on Thursday evening for the rather excellent Cherchez La Femme 'Feministmas' shindig. Theoretically, this gave us the chance to sample some of the hip and happening restaurants in the neighbourhood, but neither of us really had any idea what they might be. Instead, we decided to rectify a ludicrous gap in our blogging history - we'd been in Melbourne for more than seven years and had still never visited Veg Out Time. Finally, we thought, we'll be able to tick it off. Except that we seem to have been beaten to the punch - the old Veg Out is gone, replaced by a Thai place. Luckily, just a few doors down is Veggie Time, a restaurant that seems to be a continuation of Veg Out - it's got the same mix of hotbox and made to order dishes, a similar menu, even some of the same furniture. We haven't been able to confirm that it's the same people running it, but it seems pretty likely. The hotbox dishes are pretty appealing, with a nice mix of curries, vegetable dishes and tofu. I went for the meal deal - $9.50 gets you a plate with rice and two dishes. The black pepper tofu was excellent - the tofu dense and well marinated and the sauce bright and spicy. The lemongrass tofu was a bit less exciting - with sweetness overpowering the chilli/lemongrass flavours I was hoping for. Still, it's a hearty meal for an excellent price. The a la carte menu revolves a bit more around salads and noodles - there's pad thai ($11), char kway teow ($11), laksa ($11) and so forth. Almost everything is vegan, although some of the noodle dishes have optional egg. Cindy was intrigued by the idea of a vegetarian prawn salad ($8.50). This turned out to be a bit less exciting than I was hoping - it was basically a big bowl of garden salad (everything below the top layer in the photo above was leafy greens) topped off with a couple of prawns fashioned out of tofu skin stuffed with a tofu and veggie mix (and possibly a tiny bit of mock meat). It came with a peanutty dipping sauce for the prawns and a vinaigrette for the salad. On the whole, this was a bit heavy on the greens and a bit light on the prawns, but it was cheap and healthy and had enough novelty to be fun. 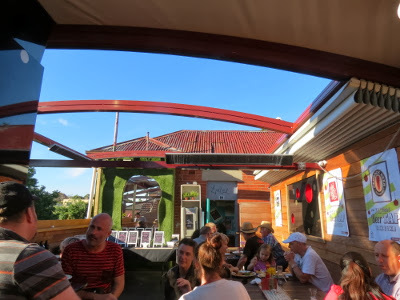 Veggie Time isn't doing anything very innovative or exciting, but they're a great option among all the mediocrity of Fitzroy Street - fast, tasty and with loads of options, it's definitely worth a visit next time you venture down to the beach. 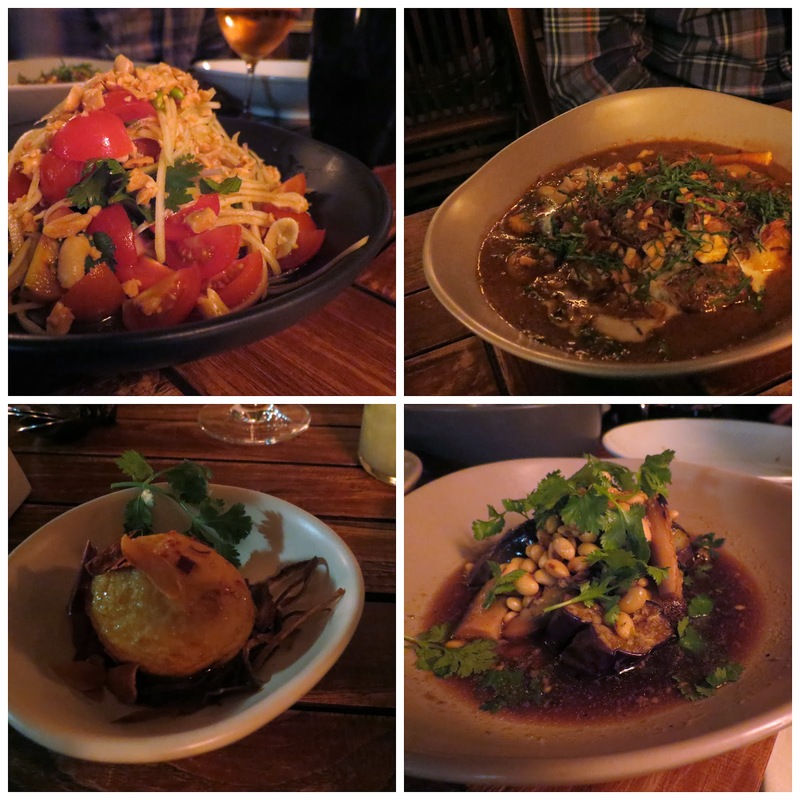 There are a couple of reviews of the old St Kilda Veg Out Time around (e.g. here and here), but nobody seems to have visited Veggie Time as yet. Accessibility: There's a small step as you enter (although there are also outdoor tables at street level). Things are reasonably spread out inside, with a mix of low and high tables. You order and pay at a low counter. We didn't visit the toilets. Back in September I thought I'd hit on a convenient choc-chip cookie recipe to end all other choc-chip cookie recipes in my repertoire. Then, to publicise her latest cookbook Isa Does It, Isa Chandra Moskowitz released a recipe and video for rosemary chocolate chip cookies. They're a similar bowl-and-fork job to my previous recipe except for, ya know, adding rosemary. It is a game-changing ingredient. It infuses the cookies with a subtle yet unmistakable flavour - green, piney, almost minty. I love it! I was able to use rosemary plucked from our burgeoning balcony garden and the leaves were especially fresh, noticeably more bright and plump than the ones I've bought from the supermarket. When incorporating this savoury element into the dough, I'd suggest that it's extra-important to add that generous pinch of salt to the mix. Unable to acquire coconut oil in time, I used margarine in my batch. My cookies were golden and tender, and didn't spread much while baking. (By contrast, veganopoulous' coconut oil batch melted out into conjoined pancake cookies!) They weren't quite the chewy caramel nirvana of my other cookies, and I'd like to play around with hybridising these two excellent recipes. Preheat an oven to 180°C and line one or two baking trays with paper. In a large mixing bowl, beat together the margarine and rosemary with a fork. Thoroughly beat in the sugars. Whisk in the soymilk, ground flaxseeds and vanilla until well combined. Sift in half the flour and all of the salt and soda and combine them into the mixture with a fork; continue with the remaining flour. Fold in the choc chips. Spray the baking trays lightly with oil and use two teaspoons to drop tablespoons of the mixture onto the trays. My cookies didn't flatten or spread much, so you could try flattening them a little with the back of a spoon. Bake the cookies for 10-12 minutes, until just golden brown, and allow them to cool for 5 minutes on the tray before shifting them to a rack. I have almost no reference point for egg nog. (Though, as always, one Simpsons quote: "'Tis the season, Marge! We only get thirty sweet noggy days. Then the government takes it away again.") I gather that it's like a drinkable custard with warm spices. Wikipedia tells me that it's also known as egg milk punch. Ummm, that sounds horrible. This vegan nog isn't horrible at all - it's a soymilk-based cocktail, taken from my recipe calendar, that made for a nice weeknight dessert. I don't like drinking soymilk straight up but there's enough brandy here to distract me from any beany-ness. Though you could just stir the ingredients together, I'd highly recommend getting out a blender, stick blender or cocktail shaker for a frothy top. Place all the ingredients in a blender and blend until frothy; serve over ice. The Fox Hotel is my favourite pub in Melbourne (especially with the recent sad closure of The Gasometer). It combines an old-school charm with an excellent (and rotating) beer selection, decent music, friendly staff and a fantastically veg-friendly menu. Oh, and possibly the best rooftop in town. So with summer finally joining us, The Fox was the perfect place to hold our final pubclub for 2013. We settled in on one of the corner tables on the rooftop, rejigging our seating arrangements to minimise glare while maximising sunshine. The Fox has a wide array of vego dishes to choose from, including their long-standing staple dishes (e.g. the mushroom, quinoa and pine-nut burger, the veggie burrito) and some newer menu additions (e.g. pan fried sesame tofu tossed with rice noddles, mushrooms, broccoli, Vietnamese mint and peanuts). Cindy and I both ordered new dishes, hence the blog post. 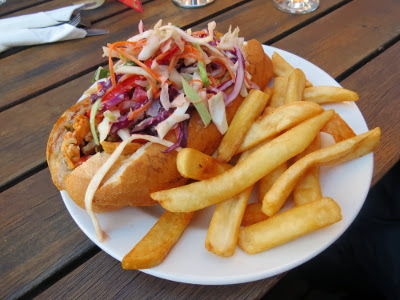 For me, it was impossible to go past the pulled tempeh roll with cheese, coleslaw, pickle and chipotle sauce with chips ($19, can be made vegan and gluten-free). I was very happy with this - the chipotle sauce had a nice smokey heat, the pulled tempeh was plentiful and delicious, and the array of condiments kept everything tangy and saucy. It was impossibly messy to eat of course - I gave up and went straight for a knife and fork. Added bonus: it comes with chips (a key criteria in my pub-meal decision making process). Cindy was lured in by the promise of tempura and ordered the teriyaki tofu with tempura veggies, steamed rice, sesame, wasabi mayo and a ginger sauce ($19, vegan and can be made gluten-free). This was another success - silken tofu with teriyaki sauce, pots of wasabi mayo and soy sauce and an array of tempura veggies. 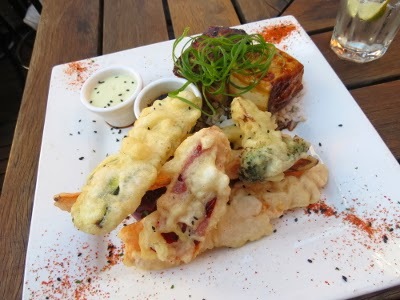 The tempura was quite thick and crispy, with the sweet potato in particular winning Cindy's admiration. It's almost impossible for me to be objective about The Fox at this point - it's hard to think of a better way to spend a summer evening than parked on the rooftop devouring the excellent food they're serving up. Read about our previous visits to The Fox: one, two, three, four, five and six. Since our last trip, there have been positive reviews from veg-bloggers I Spy Plum Pie and The Lentil Institution. Accessibility: There's a small step at entry level. Several of the indoor rooms (and probably the ground level outdoor space) have widely spaced tables; the beer garden is up a narrow staircase with rail. All orders are taken and paid for at the high bar. Toilets are at ground level. 22/03/2014: Berrissimo have just announced that this is their last weekend of trading! We'll miss them. 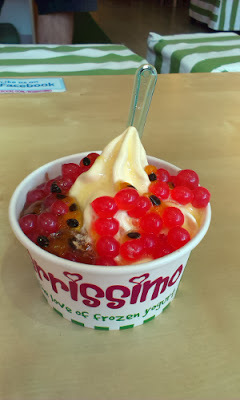 Berrissimo's vegan flavours have rotated again! The chocolate mousse has proven unshakable, and it's currently backed up by coconut & vanilla, and banana split. I put the coconut & vanilla to the test ($5.80), had a little choc mousse on the side, and topped up with passionfruit syrup and strawberry bobas (vegan-friendly jelly spheres that burst with lollyish juice). The new soft serve tastes more like coconut essence than coconut milk - for a moment I even thought they'd mis-served me the banana split, such was the fake-fruit flavour - so it's back to choc mousse and peanut butter fudge for me. When the right fruit flavour rolls around, I'll celebrate with more bobas. You can read about two of our previous visits to Berrissimo here and here. Accessibility: I think there's one step on entry, and the interior is spacious and flat. We ordered and paid at a low-ish counter. The display case of toppings is low-ish but might be difficult to view from a wheelchair. We didn't notice the toilets. We recently colluded with our friend Clamps to hold an evening of Krautrock and (vegan) Frankfurts. I can't let any event pass without dessert, and took this as an opportunity to make a German-style cake. Bienenstich, or bee sting cake, is a childhood favourite of mine. Though most of my forebears migrated from Germany, I've no particular memories of my mum, aunties or grandmothers baking a family recipe. We usually bought it from a local bakery and called it by its German name whether they labelled it so or not. Bienenstich is traditionally a yeasted, not-so-sweet cake sliced into two layers, filled with a thick custard and topped with a golden brown crunchy almond toffee. Strangely the recipe I hand-copied from my mum more than a decade ago doesn't include yeast. Neither does the bee sting cake in Leigh Drew's Vegan Indulgence. The latter recipe skips the eggs and introduces orange juice to the custard, but otherwise the ingredient lists corresponded well so I decided to go with Drew's all-vegan version. I really like that Drew incorporated almond meal into her cake batter - though I don't think it's traditional, it brings a certain sturdiness to the crumb and confirms almonds as the feature of the cake. The orange custard isn't much like the whipped-cream fillings I encountered as a kid but it succeeds by echoing the orange-and-almond meal pairing popular in gluten free baking. It takes a strong custard to hold up a cake layer and mine didn't quite cut it - I used about a third of my custard as filling, saw that any more would surely spill out onto the plate, and served the remainder on the side. For all that custard and almond meal, this cake would be nothing without its almond toffee topping. It's spread over the cake during the last 10 minutes of baking, allowing time for the almonds to brown and the toffee to set hard. The toffee syrup also snuck down the sides of the cake, creating a gorgeous, sticky caramelised crust. The almond toffee was the true trigger for my sweet-toothed nostalgia, and this recipe's crackly topping was the stuff of Sunday morning teas with my extended family. Preheat an oven to 180°C. Line a springform cake tin with paper. In a large bowl, sift together the flour, baking powder and sugar. Stir in the almond meal. In a second smaller bowl, whisk together the maple syrup, vanilla, vegetable oil and vinegar. Pour the soy milk into the large bowl of dry ingredients and stir them together. Add the oil mixture and combine thoroughly, but don't mix more than you have to. Pour the cake batter into the lined cake tin and bake for 30 minutes. At the 20 minute mark during baking, prepare the toffee. In a medium saucepan, melt together the margarine and sugar. Allow them to simmer for about 2 minutes, then stir in the soy milk. When the mixture is smooth, take it off the heat and stir in the almonds and salt. When the cake hits 30 minutes in the oven, retrieve it and spread the top with two-thirds to three-quarters of the almond toffee - whatever it takes to get an even layer of almonds across the top. Return the cake to the oven for a further 10 minutes, until the almonds are golden brown and a skewer through the cake comes out clean. Allow the cake to cool in the tin for 15 minutes, and then completely on a bench or cake rack. Make the custard in a large saucepan. Start by placing the custard powder in the saucepan and gradually stirring in orange juice to form a smooth paste. Continue adding orange juice and then soy milk gradually and mixing as you go to retain a smooth texture. Place the saucepan over low-medium heat and cook it, stirring continuously, until it's thickened, around 10 minutes. Remove the custard from the heat and whisk in the agave nectar. Chill the custard for at least 4 hours in the fridge. When the cake and custard are cool and ready, carefully slice the cake horizontally. Spread the remaining almond toffee on the bottom half of the cake. Top it with the cold custard. You really need it to be a sturdy custard that can take the weight of the top cake - if in doubt, reserve some of the custard and serve it on the side of the cake. Gently place the top half of the cake over the custard-spread base. Chill the cake thoroughly before serving. After an incredible dinner at Easy Tiger, we were lucky to be able to schedule a second catch-up with our visiting friends - this time at a more kid-friendly time and location. Astonishingly, it's been seven years since we visited the Collingwood Children's Farm and associated cafe. It remains as charming as ever - there are chickens and goats ambling around, a farm cat soaking up the attention and just a lovely outdoorsy vibe (admittedly this was a Friday morning - I get the impression it might be more of a madhouse on the weekends). The cafe is divided into two bits - one on the farm side (requiring admission fees to the farm) and one off the bike path - once you've made your decision you're kind of stuck. The menu is focussed on local produce: lots of eggs, cheeses and veggies - so things are excellent for vegetarians but not really that great for vegans (in fact nothing on the menu is vegan by default - I assume they'd be able to rejig dishes like the beans though). They're much more concerned about gluten-free options, with well labelled dishes spanning sweet and savoury. Cindy couldn't resist the allure of a breakfast crumble (berry and pear compote with toasted nut and buckwheat granola and blackberry yoghurt ($12.50). It looked amazing - vibrant pink yoghurt and a colourful mix of fruit and nuts. Unfortunately, it didn't quite measure up - Cindy found it a bit too sweet, with a mixture of canned and fresh fruits and a sweet berry flavour in the yoghurt. The topping seemed to be mostly ground nuts and not other crumbly things like oats (it is gluten-free, which probably explains this choice). I went savoury with the goat's toast (creamy goat's curd, house beetroot relish, avocado, a poached egg and herbs on toast ($16.50). This was an excellent choice - the toast was covered in a slightly sweet beetroot relish, there were two generous dollops of tangy goats cheese and loads of delicious fresh greens. I'd have enjoyed it with two poached eggs rather than one, but that's really just me being greedy. The coffees were fine and the service friendly, but the Farm Cafe is really all about the atmosphere - it's such a lovely place to sit on a cool Melbourne morning. With the farm around you and the river winding past, you quickly forget that Collingwood and the city are at your back and just relax. It's obviously a great spot to take kids as well - the cafe caters well for them and the farm provides endless entertainment. Read about our first visit to The Farm Cafe (seven years ago!) here. There are uniformly positive blog reviews of The Farm Cafe - check out Ichigo Shortcake, MEL: HOT OR NOT, ediblethings, Brunch Addict, Pramsandwich, The Cheeky Skunk, Ronnie's Spots and little eats. Accessibility: We came in the farm-side, which involves a gravelly path to the table area and then four or five steps up to the counter. You order at a high counter and carry your own drinks back to the table, while the staff bring the food down for you. We didn't visit the toilets. January 2016: Albert Street has had a redesign and has reopened as Albert & Sydney. We backed up from Cindy's birthday dinner at Easy Tiger with another slightly fancy night out. The destination this time - Albert St Food & Wine, purveyor of high class desserts and decent vegetarian savouries. We wound up at one of the high tables this time, which gave the whole night a more casual vibe than our last visit. The service remained exemplary though - helpful and friendly without being pushy or intrusive. They got us started with some lovely bread, served with a basil and olive-oil infused butter. The menu isn't amazingly veg-friendly - there's a couple of starters, a pizza, a pasta and some sides. I understand that they're happy to wing it if you ask them nicely, but the basic menu doesn't have you overwhelmed with options. We ordered a couple of repeat dishes from our earlier visit - the sublime grilled haloumi with pickled zucchini (above, $17) and the equally impressive ancient grain salad with pomegranate, walnut and goats curd (below, $14). We also branched out into some new dishes - first up the summer greens with chardonnay dressing ($14), a lovely combo of fresh beans, peas and asparagus. The heartiest dish we tried was the gnocchi with exotic mushrooms, hazelnuts and truffled pecorino, rich with cheese and a nice variety of mushrooms (but barely justifiable at $32). The key goal of anyone's visit to Albert St is dessert - even if Philippa Sibley has recently moved on. Half our table were too full, but the three of us who knew the score found space to split two desserts between us. First up, the 'milk and honey' ($20) - different shades of honey, chocolate and caramel with black sesame. Our other choice was the couer a la creme, with raspberries and rose geranium ($19). The little heart was a rich and creamy mascarpone, set perfectly against the berries and the tart sorbet. These guys really know their sweets. Albert St is a lovely local option for a slightly fancy night on the town - great food, wonderful service and mind-blowing desserts, all served up in a pleasingly moody atmosphere. We haven't really tested them, but the word on the street is that they're quite competent at serving up vegan food too, so they're a good option for most of our readers. Read about our previous visits to Albert St here (back when they offered breakfasts) and here. Since our last visit ChopinandMysaucepan and Let Me Feed You: Melbourne have enjoyed their meals. Accessibility: Albert St has a ramped entryway and is fairly roomy inside. Ordering and payment happens at the table. The toilets are on the same level and are fully accessible. Some far-flung friends of ours made a rare trip to Melbourne last week, and I was lucky to share my birthday dinner with them. We arranged to meet up at Easy Tiger for their second sitting, after our friends' kids were tucked into bed, and were seated in the restaurant's warm courtyard out back. Easy Tiger briefs its staff to be a smidge over-prescriptive with the menu, but I think they've loosened up a little - while I feared that we'd be faced with everyone-has-the-same-banquet-or-no-one-banquets, they were actually happy to accommodate two vegetarians and two omnivores, one of whom has a shellfish allergy. (This bodes awfully well for vegans and coeliacs, and it looks like they have a handle on fructose-free too.) We picked the $75 rather than the $95 version, figuring there'd be enough mains to go around. They also offer an unprecedented four different beverage matches - non booze ($25), crisp wine ($35), not wine ($50) and luscious wine ($60). I predictably picked the former. My citrussy soda was just the thing to cut through the starchy, chilli-salted taro chips. The vegetarian 'meatballs' were mostly peanut, flavoured with palm sugar, tamarind, and galangal,and perched atop watermelon chunks. I don't really get this fried-and-fruit pairing, but Easy Tiger have been running with it for a while. To take me through the remainder of the savoury dishes, I was served a mocktail of pineapple juice, milky calpis and coriander. Our entrees continued with rounds of silken tofu in a thin salt-and-pepper batter, with a pickly side of iceberg kim chi. Dolmades usually leave me cold, but betel leaves are another story! They're so fresh and fragrant. These ones were stuffed with puffed rice, peanuts, lots of coconut, and fried eschallots. This little salad included baby corn, Thai eggplant, lemongrass and toasted rice, but mostly I just tasted pickled cucumber. We were hit with a number of mains and some steamed rice all at once. Our waiter warned us of the single green chilli hiding in the green papaya salad (top left), and I accidentally hit it. It partially ruined me for the other dishes and completely ruined me for conversation for a good 15 minutes or so. Hence I missed the subtler notes of the creamy kipfler potato massaman curry (top right) and the son-in-law egg (bottom left) fell a bit flatter than last time. I did enjoy their reintroduction of the eggplant with thick, smoky wok-fried rice noodles and soy beans (bottom right, apparently it's been missing from the menu for two or three years). As a palate cleaner I was presented with a small aloe vera juice, bobbing with little ice cubes and jellies - it thoroughly restored my chilli-ravaged tongue. With dessert I was served a much darker, woodier pu-erh tea, adding depth to a bowl of coconut sago pudding with strawberry jelly and palm sugar syrup. I must confess that I'd been hoping to revisit the pandan dumplings, and as a sweet birthday gesture Michael ordered a bowl of them to share. Matching his sweetness, our waiter rushed the order up to the kitchen before they closed and the dumplings were delivered, neatly divided into four portions. (I suspect they might even have generously given us two servings for the price of one, $19). These truly are amazeballs - bready, gently herbal pandan gradually giving way to molten dark chocolate, with a thin salted coconut cream and a little lift from fresh melon balls. Our bill arrived with cute Easy Tiger-insignia candy - sweet and sour, a little salty with a shocking slow-burn heat, all in the spirit of Thai cooking. While much of this banquet was familiar from our previous experience two years ago, there were some neat new innovations, fun flavours and no sense of boredom for us. 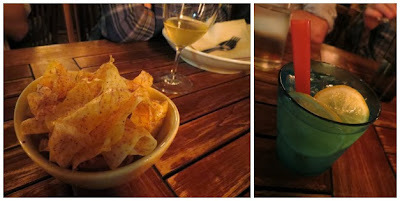 You can read about our prevous visits to Easy Tiger here and here. Since then it's received positive reviews on MoMo & Coco, foodie about town, The Chommery, Gourmet Chick, Barley Blog, Where Adles Eats and Smudge Publishing (business associates). Meanwhile, Melbourne Patron loved the food but felt let down by the service, and the experience didn't meet the expectations of Popcorn & Toast or I Eat Therefore I Am. Accessibility: There's a ramp on entry, somewhat crowded tables with a decent walkway through the restaurant and female and marked unisex disability-friendly toilets on the same level. Male toilets and a downstairs courtyard are less accessible. There's full table service. On Tuesday night I had a rare meal with my cousin, his wife and her Caulfield-dwelling friend. It was a welcome opportunity to get on the train and revisit Gujju's Cafe & Chaat House. Michael and I were impressed with their all-you-can-eat thalis five years ago, and this time my companions were game for the other side of the menu, the chaat (snacks). We were overwhelmed by the dozens of dishes listed, and our waiter confidently suggested a selection that would best serve as an introduction. Our first dish had a base of savoury legumes and a topping of crunchy noodles, onion, tomato and chutneys (I think it's called sev ussal, $8.50). Next we assembled pani puri ($8.90), spooning the onion, mint flavoured water, and tamarind syrup into the thin, crisp puri pockets -the challenge was to devour them before the fillings dripped through a saturated puri base! The spicy papdi chaat ($8.50) featured thick crunchy papdi chips tossed with more sev noodles, onion, tomatoes and chutney. I believe our final dish was dahi vada ($8.50), where spiced yoghurt and chutney concealed thick, tasty lentil cakes. Several dishes had a bit of a burn and I was glad to have a mango lassi to nurse me through it. Gujju's chaat are a major departure from our usual Indian restaurant orders (only one or two of our Atithi dishes come close). This array of snack foods probably doesn't constitute a balanced meal - there's lots of fried and salty elements and sparse fresh vegetables, and I departed feeling heavy with yoghurt and garlic - but they're a lot of fun. Vegan and gluten-free options aren't clear, but our waiter was seemed to know his stuff and I reckon he could've pointed out diet-friendly dishes. Gujju's setting is very casual - the lighting is a little harsh but, sitting amongst local families on a weeknight, it was a comfortable spot for an unhurried catch-up. You can read about our first visit to Gujju's here. Prasanna Gopalakrishnan rates it among the best Indian restaurants in Melbourne, and it also has a fan at G'day India. Accessibility: Gujju's has one step up then around three steps down at it's entry. Tables are quite densely arranged. We ordered at our table and paid at a high counter. I didn't visit the toilets. We gathered up a posse of veg*n food bloggers (featuring Rachel, Steph, Hayley and The Simple Eater) on Sunday night and headed out to Doncaster for a return trip to the popular mock-meat restaurant Vegie Mum. It's very much a typical suburban Chinese place - plastic tables, plastic plates, friendly staff and a ludicrously long menu. The only difference is that it's all vego. The manager was out and about the night we were there, organising birthday songs, suggesting dishes for us to order and generally being charming. We put our faith in Steph and The Simple Eater to do the ordering, and they put together a very impressive spread for us. A brief warning: not everything on the menu is vegan - eggs pop up in a number of dishes, so keep your wits about you. They got us started off with a complimentary bowl of this tomato-y broth, which didn't really do a lot for me. As part of the ordering process, The Simple Eater managed to negotiate this off menu delight - a mixed entree platter (the price is lost to the ages I'm afraid). It was made up of deep fried taro, chicken drumsticks, a fake abalone salad and a surprising batch of scrambled eggs. The taro balls were super starchy and really needed heavy saucing to really work, but the real highlight were the little chicken drumsticks, with crispy 'skin' coating some excellent mock chicken. I was already starting to get full as we finished this platter - good thing we'd ordered 8 more dishes I guess! We also ordered a couple of roti ($4 a serve) to dip into the saucier dishes - they were thin and flaky and helpfully pre-shredded for sharing purposes. The first main dish to arrive was the combination fried rice noodle ($10) - thick rice noodles, fried up with broccoli, carrot and a whole bunch of different mock meats (at least char siu pork, prawns and chicken). The sauce was mild and a bit sweet and the noodles fried enough to have just a hint of wok hei. The lemon chicken ($15) was slightly different than the classic Oz-Chinese dish - rather than the usual soggy, sweet mess, this was a dish of crispy friend 'chicken' pieces with a tangy sauce to pour over. Excellent. My favourite dish of the day was the assam fish ($18) - battered chunks of fishy tofu served alongside a tangy and slightly sour tamarind-based sauce loaded up with beans, carrots and tomato. The Sichuan eggplant hotpot ($18) was tender and oily, with lovely sweetness but minus the chilli hit that I'm looking for in my hotpot. The curry chicken ($15) had a bit more heat to it and had a nice balance of coconut fattiness and fresh veggies as well as plenty of chunks of soy-based chicken. This worked particularly well with the roti. The mapo tofu ($14) was probably the most disappointing dish of the night - the tofu, veggie and mock-pork combo was ideal, but the sauce was completely lacking in chilli, leaving the whole dish a bit bland. We ordered a serve of Chinese greens ($15) to break up all the mock meat - just wasted calories as far as I was concerned. The final dish was the Char Kuey Teow ($10), which had been delayed via the initial inclusion of egg. This remade version was solid - smokiness from the wok the dominant flavour (the side of chillies was good idea to add a bit of punch). For those of us who could still fit more in, things were wound up with some refreshing orange slices and little jellies. I'm still stunned that we managed to work our way through most of this food - it was a ridiculously big meal, with lots of highlights. You can see why Vegie Mum is so popular (it was heaving with people the whole time we were there) - the service is friendly and the food is decent. You get more out of it if you go in a group and can order widely - it's definitely worth putting together a gang and paying it a visit. Read about our first visit to Vegie Mum here. Since then it's been given the thumbs up by vegan about town, melbourne with the rocket, egg tarts and apple pie, The Food Society and The Good Hearted. Accessibility: There are a couple of steps up at the entry, then things are flat and relatively high density inside. We ordered at the table and paid at a low counter. We didn't check out the toilets.